Positioning themselves as the Open Innovation leader Orange has just announced several initiatives to establish new platforms of innovation. Stéphane Richard himself took the stage at the Orange Hello Show to make some very bold announcements on how will Orange take advantage of its global presence and expertise in mobile networks to push new services to consumers, in areas such as mobile payments, connected home, location services, a health vault and others. Instead of developing these services themselves Orange is working with multiple players – from startups to big corporations – where each one can excel and take part of the network that Orange can provide. In a scenario where Telcos have closed walls on their services the approach Orange is taking will for sure shake the ecosystem dynamics, making the network more porous for others to join and bring their own value. In anticipation of the explosion of connected devices for the home Orange launched today their own platform for the home. Built on top of their current set top boxes they launched a bunch of connected devices that for now cover only basic functionality – mostly surveillance devices with intrusion detection, over the web video for monitoring the home, connected plugs, etc. The platform has been built with industry standards (over radio frequency) and they invite external developers to integrate their devices and services with the Orange platform. While it’s still restricted to Orange customers the potential audience is truly global, and assuming that all Orange customers have their set top boxes there is really no question if you want to make your home “smarter” and already are an Orange customer. Huge potential, massive reach. While health and fitness tracking devices are already prevalent today their application is still largely an individual experience. With today’s announcement Orange introduced the Connected Health Center, a platform for users and doctors to share relevant information wherever they might be. So if your doctor visits you at home or in any other location he will be able to access your medical history and add on top of that information. Again the platform is open so existing services can integrate with it to aggregate all your health related data. Regarding privacy the service provides a sound security layer given that all access requires your sim card authentication plus your doctor’s medical card if he wants to consult it. For some time now this has been an area of intense competition to bring mobile payments to everyone while on the go, specially useful to use at the market, with the plumber, or with the delivery boy. Orange had already a service for mobile payments in some African countries (like Côte D’Ivoire and Sénégal) and is now ramping up their reach. With Orange Money users can use their phone to pay their bills, and transfer money to other people through their mobile phone number (no bank card or physical presence needed). This service gives you a pre-paid virtual account where you can receive and withdraw money at Orange and its partners’ shops. While you only need a phone to use this service Orange also introduced a Visa card associated with your virtual wallet, so that you can use it as it was a regular bank account – pretty neat methinks! For France their are introducing Orange Cash and Paiement Pro which are slightly different than the previous. Since here most people already have bank accounts and plastic money is prevalent Orange is introducing a device directed towards small or individual business to receive payments anywhere (paiement pro). We already know concept from Square from their square-shaped dongle attached to your phone, but since this is Europe and we have different regulation (in France you are required to have a pin code instead of just swiping the card) the operation of the device is slightly different – but largely the same experience. You need a smartphone (again, sim card authentication) which communicates with a phone-looking device that is used to swipe the card and mark the pin code. This device costs 99€ and the service has no fixed costs (with only a variable cost of 2,5% on the transaction). Orange Cash is similar but doesn’t require a bank card to any part, using only NFC to exchange money between two parties – much like Orange Money. Ma Ville dans ma Poche is the name of Orange’s new service looking to put the city in your pocket. Its flavored as a mobile app for smartphones and tablets, whenever you pass through a billboard ad that you like you can use NFC to tag the ad and get additional info on your phone. In the background Orange gets to know you a little better and starts to build your profile based on your interests – not only the type of ads you like, but also by untapping their knowledge from where you walk around, remember that Orange knows everyplace you visited given that you had network coverage! Running on top of the app there is another app directed to merchants which can input deals for their businesses – a 10% discount on running shoes or a 50% discount on lunch the next monday. With advanced artificial intelligence and big data Orange will then match the offers to the consumers targeting only those who share those interests and are in the vicinity of the deal. Through their smartphones users get notified of deals and can take the deal, for example, by booking a table at that restaurant right from the app. When they get there the merchant will have a terminal with NFC (and other technologies) so that the user just taps his phone and the offer gets redeemed. I’m not sure if Orange has the right complementary assets to pull this one, in a way they cannot really open this service to 3rd parties without selling off your privacy (which they won’t), on the other hand I’m not so sure if their network will be enough to get ubiquitous acceptance. Following the announcement of Orange Fab Season 2 in the Sillicon Valley Orange has just announced they are bringing the program worldwide. We have previously questioned ourselves when would it come to France and we need to look no further! Paris will be the next edition to launch followed by other regions in Europe (Poland will likely be the next one in Europe) and Asia. Each one of the non-french editions will have 2 Demo Days, one in their city and one in Paris – much like it happened for the Valley edition, and the French edition will have also one Demo Day in another region (possibly in the Valley). Details are still scare but expect to get a similar program as it was happening until now in the US with small adjustments to country specificities in terms of funding, mentors, and the ecosystem. Aiming at bringing innovation back into Orange the Orange Fab is a great example of how companies can use Open Innovation to complement their internal R&D teams – well done Orange! The event was also used to announce other products such as a mobile projected television and other services relating to Orange’s 4G network and the general user experience. For users this is all very interesting because Orange’s economic model relies on monetizing its voice and data services. Meaning that while they can offer you cloud storage, and open their network for others to build on top of it, they will never monetize your information. Given that Telecos are one of the most disliked companies out there this might as well come to change that. All of the current “free” services that you can get elsewhere come at the cost of your privacy or data protection. In this new scenario you are the consumer and not the product – putting Orange a clear advantage when choosing cloud services. 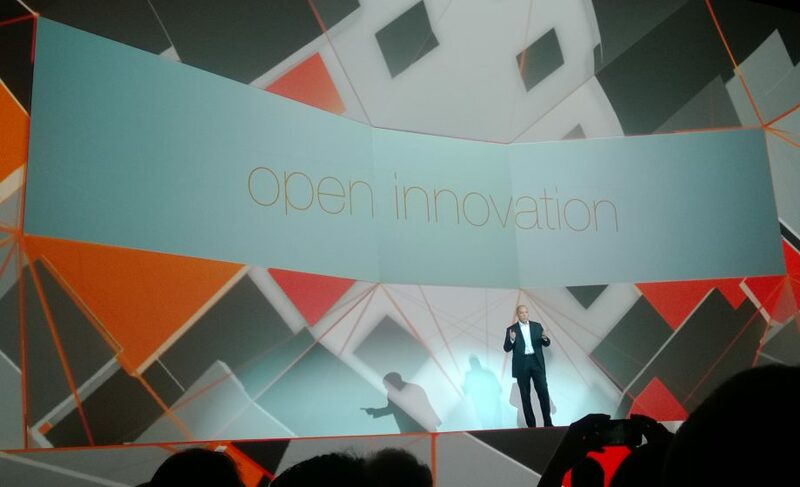 Overall Orange really set a bar on Open Innovation today. Telecos have 3 big advantages for the cloud: high level security though the sim card, their monetization model around the service and not the content, and their huge network reach and Orange really emphasized this today. This was just the tip of the iceberg compared to what they can still do, they also showcased their Open Data initiatives but the information available for developers is still very limited. The success of these new platforms will be sentenced by their partners and third party developers eager (or not) to jump in. Right now, the Orange Cloud looks very promising. Wow … how is is that Orange has not released any innovative product for the last decade if they’re so good at Innovation ? I mean possibly a few new things in termes of network quality, but I mean consumer products/services ? You really believe in that health thing ? What about that new payment gimmick ? You really think there’s a chance of mass adoption here ? I would have to agree, this was a snow job to make it look like they are open and innovative. None of this stuff will make it to market in any meaningful manner. After last year’s embarrassing revelation that Orange’s innovation is nothing more than theft, this was an opportunity to make it look like they are open and accommodating. Bringing in third parties, small companies and pretending to be the beneficent big brother was shameful. $20K USD for Fab is a joke…this is just a PR stunt to make it look like they are friendly to startups when they are truly not. But in their defense at least they are trying to look good, and sprinkling $20K around here and there and then bringing the guys on stage for Hello makes sense. I’ll pay you $20K and you get to be my friend. Come on stage with me and talk nice. If any of these services use a similar user interface to Orange’s website I will be giving them all a wide berth. It’s the worst site I’ve ever used.